Beautification of our Passyunk Square area has always been one of the civic association’s major tenets, and below are some prime examples of the hard work that volunteers like you have engaged in over the past seven years. For any general beautification interest in our Passyunk Square area, and to get on the specific beautification mailing list, email us at beautification@passyunk.org! Over the past few years, volunteers have helped to create two wonderful community gardens in Passyunk Square, where healthy, pesticide-free foods and beautiful flowers are being grown, and where, more importantly, a greater sense of community is being fostered. Harry O’s Passyunk Gardens at Passyunk and Wharton sts is best-known for being the creation of the Rachael Ray television show in August of 2011, but is now a neighbor-run pocket green space that grows a multitude of organic fruits, veggies, and herbs. The garden is run with a collective spirit in mind, with any and all neighbors able to come in and get their hands dirty. Open hours for the community are Sundays from 4-6pm from April to November and some weekdays during the summer months. For more information visit our garden page. Capitolo Community Garden at 10th and Federal Sts is a 40+ plot garden that arose from a run-down patch of Capitolo Playground that had been a neglected baseball diamond. After neighbors inquired about the parcel’s availability, the generous and accommodating advisory board at Capitolo got the city to remove a rusted backstop, metal fencing, and concrete, and allowed volunteers to erect a fence, create their own raised beds, and begin transforming the land. Members pay $45 per year to use the space for their greening pleasures, and participate in common-area workdays that include activities such as mulching, building new flower boxes, and filling water barrels. Capitolo Community Garden was awarded one of the Pennsylvania Horticultural Society’s First Place Honors in its yearly garden awards at the 2010 Flower Show. To inquire about getting on the wait list, or other info, please email capitologarden@gmail.com. 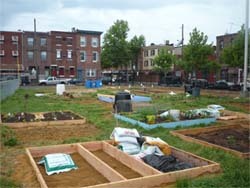 Know of any vacant lots on your block or immediate area that could use some greening? Let us know, and with a little work, the next great community garden could be on your block! We have limited vacant land in our community, but there are a few spots hiding around that, with a little investigating and hard work, could become amazing places. Promoting art in our area is an inexpensive, creative, and lively way to improve the aesthetic appeal of our neighborhood, and we have undertaken a variety of projects that aim to do just that. Last summer, renowned mosaic artist Isaiah Zagar enlisted a few local volunteers to help him create a ‘sign’ at the entrance of Capitolo Playground at 9th and Federal sts. His signature style of mosaic work has livened up the streetscape, and you can also see examples in our neighborhood on some businesses such as Black & Brew (1523 E. Passyunk Ave) and Kun-Yang Lin Dancers (1316 s 9th st), as well as on walls at 10th & Dickinson and 7th & Reed sts. After completing the mosaic on the front of the Kun-Yang Lin building, which also had mosaic work on the building’s rear on Percy St, Zagar has also expressed an interest in mosaic-ing the entire 900 block of Percy St, a block that has often fallen victim to graffiti and short dumping. This project is in the early stages of development, but in the meantime, anyone with a wall on their home can email Isaiah and ask him to turn it into a work of art, at zero or minimal cost. Email him at info@philadelphiasmagicgardens.org or check him out on Facebook. The Mural Arts organization is world-renowned for creating amazing public art pieces in Philadelphia, and a wonderful example of their work is the tribute to local Philadelphia musicians at 9th and Wharton sts on the South Philly Bar & Grill’s building. This summer, Mural Arts has unveiled an even more ambitious project: to transform the main building at Capitolo Playground into a work of art, using both paint and mosaics, with help from volunteers in the community as well! We’re always looking for ideas for other types of public art, whether it’s creative bike racks, creative lighting, or whatever you might have a talent for! If you or anyone you know has artistic merits who you needs a canvas for their talents, email us at beautification@passyunk.org. Check out some of the more creative ideas that regular citizens have come up with as ways to green their homes and the sidewalks in front of them! Have a neighbor with a great beautification idea? Send us a photo at beautification@passyunk.org.